Lively Old Oval Opal & Diamond Cluster Ring [SH10143] - £950.00 : loveVintageDiamonds.com, Your Vintage Diamond Dreams Come True! The lively oval opal in the centre of this ring is surrounded by eighteen lovely old-cut diamonds weighing a total of approximately 0.72cts. The shoulders to the ring are also extremely attractive with their split-shank scroll detail. The metal is yellow throughout and the settings and shoulders are faced in white. 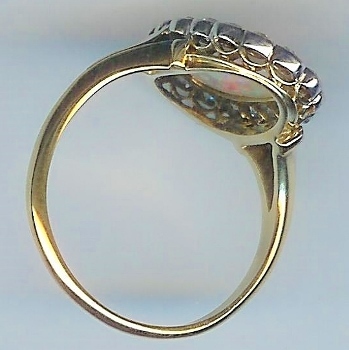 The shank is stamped '18ct' to indicate that it is 18ct yellow gold. The ring weighs approximately 3.2gms and currently fits finger size 'L'/2' (UK).